A great leave-in is the foundation to the perfect wash & go. When it comes to leave-in conditioners, my mind automatically goes - "who gave me the best wash and go's of 2017?" Because in all honesty, what leave-in you use is just as important as what curl definer goes onto your hair. Too moisturizing, and you've got a never-drying sticky mess. Not enough hydration, and your curls will look like something out of the Dust Bowl. All the leave-in conditioners on this list provide a happy medium of moisture, while capturing curls, minimizing frizz, and improving overall style outcome. Meet your champions! When I first got my hands on the new Pomegranate & Honey Collection from Mielle Organics, the homegirl @Naturalista86 (Hey Michelle girl!) told me that the Leave-In Conditioner was EVERYTHING. She ain't NEVA lied. I've been waiting for a leave-in from Mielle Organics like this for a long time. While the White Peony was nice, it wasn't the kind of leave-in I preferred. In general, I don't rock with spray leave-ins like that (barring a handful of exceptions). But this right here? This stuff right here?! Worth. The. Wait. Tons of slip. Ultra hydrating. Rich and creamy, without being greasy. Penetrates easily into the hair, leaving it silky smooth. Easily one of my favorites from the Pomegranate & Honey Collection - and a definite stand out in 2017! Where do I begin?! My love for the Urban Hydration Naturals Coconut Oil Leave-In Conditioner was INSTANT. Like, magical. Even on my naked, non-drenched hair, the curl poppage with the Coconut Oil Leave-In was instant. As was the shine. The Coconut Oil Leave-In was honestly thicker than anything I've ever experienced in a leave-in conditioner, but the performance was AMAZING. No white residue whatsoever. Despite its thickness, the leave-in soaked right into my hair, while making it incredibly easy to work through. I literally could not ask for anything more from a leave-in! I love a good leave-in that makes my curls pop. That's exactly where Kriya's Royal Fruits High Porosity Leave-In Conditioner comes in. Because it's pH balanced and designed for high porosity hair, this leave-in gets my curls ALL the way together. I'm not even gonna say much else - just look at the levels of clumpage, poppage, shine, and definition in this video - and then you'll understand why Royal Fruits High Porosity Leave-In Conditioner is on the list! You guys know I love me some tgin. 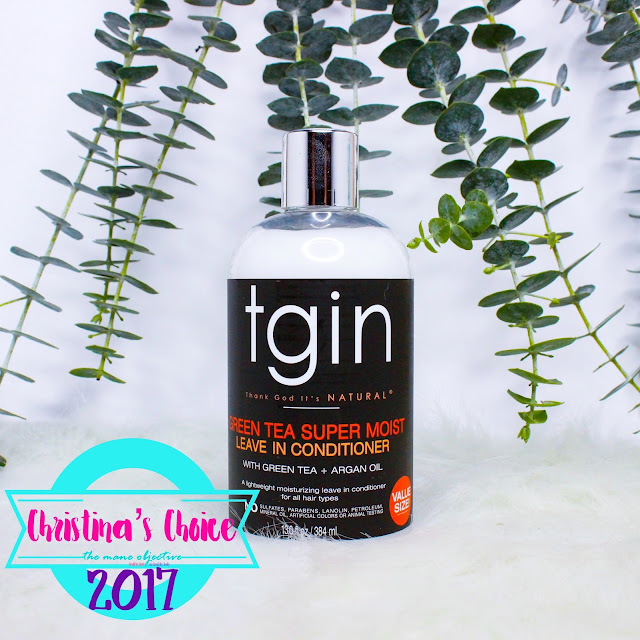 When tgin dropped their Green Tea Moisturizing Leave-In Conditioner in 2016, I was hooked instantly. Packed with green tea extract, aloe, cocoa butter, argan, and sweet almond oils, this ultra creamy and moisturizing (yet light) leave-in showed my curls some major love. 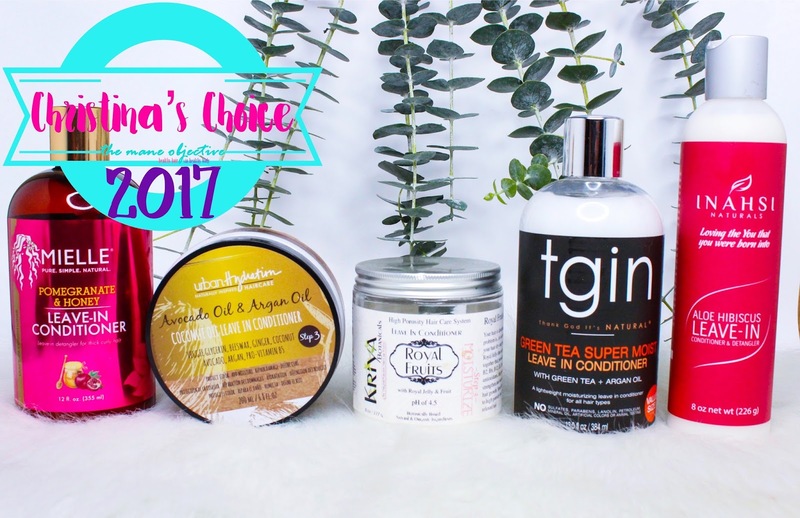 It plays nicely with virtually every curl definer in my stash - including another tgin product that I fell head-over-heels in LOVE with this year. I can't count how many bottles of Green Tea Moisturizing Leave-In Conditioner I went through in 2017. Of all the Inahsi Naturals products, the Aloe Hibiscus Leave-In easily one of my favorites, for a number of reasons. I absolutely love everything about the leave-in - from the consistency and feel, to the performance and how well it plays with other products. It's super creamy and smooth, but does not feel greasy, or waxy whatsoever. Seriously, the Aloe Hibiscus Leave-In is pretty much foolproof - you can use a little or a lot and still get great results without your hair feeling parched or weighed down with product. It gives me the same pH balanced curl poppage as Kriya Botanicals - especially when paired with Obia Naturals Curl Enhancing Custard. That's literally one of my FAVORITE wash & go combos ever. 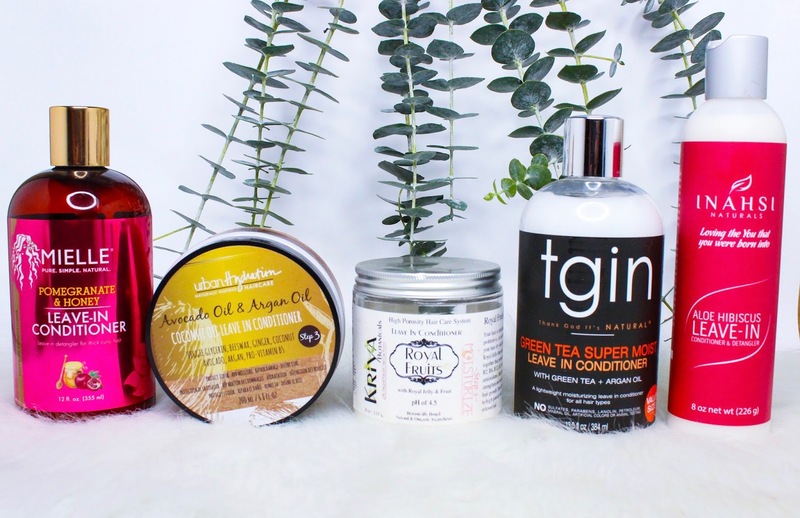 Read More: The Inahsi Naturals Curated Collection is EVERYTHING! Y'all - in 2017 I HAD to give it up to tgin. The Green Tea Super Moist Leave-In Conditioner has easily been the most dependable, reliable, consistent, super-performing leave-in. I can't tell you how many bottles I've purchased. At one point during the year, I had a stash of 3 leave-ins, and 3 bottles of Curl Bomb, and was still going to Sally's to re-up. Heck, last week I was in Sally's and saw the limited pink label and picked it up just because. The love is just that real. And so is the fear of running out. TGIN Green Tea Leave In is my favourite as well!